All of our synthetic web products are designed for long life under punishing conditions, but they will eventually wear out after extended use. The key is knowing when to replace them, and that’s why it’s very important to inspect your slings on a regular basis. We’ve developed an inspection program based on the procedure outlined in ANSI B30.9 that will make the most of your investment. The importance of following regular and uniform inspections. A respect for the capabilities and limitations of synthetic web slings. The need to keep complete, permanent records. Perhaps most importantly, a lot of common sense. Sling usage – the more you use a sling, the more you need to inspect it. The working environment – the harsher the conditions, the more often you need to inspect. Sling service life – based on your experience in using slings. It’s a good idea for the person handling the slings to visually inspect all slings before each lift. Additional inspections should be performed at least annually by a qualified designated person and permanent records kept. OSHA specifies, “Each day before being used, the sling and all fastenings and attachments shall be inspected for damage or defects by a competent person designated by the employer. Additional inspections shall be performed during sling use, where service conditions warrant.” In other words, you should visually inspect your sling before each lift. Broken or worn stitching in load-bearing splices. Excessive pitting or corrosion, or cracked, distorted or broken fittings. Other visible damage that causes doubt as to the strength of the sling. Anytime you see our Red-Guard® warning yarns. Anytime a sling is loaded beyond its rated capacity for whatever reason. While most of these standards are very specific regarding reasons for removal, others require your good judgment. The critical areas to watch are wear to the sling body, the selvage edge of webbing and the condition of the sling eyes. These are some of the most common types of web sling damage caused by abuse and misuse. When you see any of these problems during your regular inspection, stop. Replace the sling immediately because the damage is done. Never attempt to mend the sling yourself and, more so, never attempt to lift with these slings. Whether a sling is damaged from improper use or normal wear, the same rule applies in all cases: Always cut the sling eyes and discard the sling right away when you see damage. Only with properly working slings can you take a load off your mind. The distinguishing sign of a tensile break is a frayed appearance close to the point of failure or damage. This usually happens when a sling is loaded beyond its existing strength. The photo shows an example of a sling pulled to destruction on a testing machine. You can avoid tensile breaks by never overloading your sling. You can easily see a cut in your sling when you see a clean break in the webbing structure or fibers. This can results when a sling contacts a load edges, protrusions and corners, abrasive surfaces or unprotected edge of a load. This can happen anywhere on the sling body or eyes. Many slings feature Red-Guard warning yarns to alert you of serious cuts. One way you can avoid cuts from contacting sharp corners is to use wear pads on the sling to protect the fabric. A good example is the photo shown here. It shows what can happen when you use a sling that’s already been cut by an object along one edge of the sling body. The cut sling should be removed from service, continued use will ultimately lead to sling failure. The solution, obviously, is to never use a sling after it’s been cut. Anytime you see frayed fibers on the surface exposing the “picks,” or cross fibers, of the webbing that hold the load-bearing (lengthwise) fibers in place, it’s abrasion damage. The most common abrasion damage occurs either when the sling slips while in contact with a load duringa lift or when the sling is pulled from under a load. When you see the Red-Guard warning yarns exposed, it’s your signal that serious damage — and loss of lifting capacity — has occurred. We recommend that slingswith any damage to load-bearing fibers be discarded. Wear pads are one way to avoid this damage. It’s true nylon and polyester webbing are stable when exposed to many common chemicals, but they should never be exposed to any strong acids or corrosive liquids whenever possible. The same is true for metal fittings on slings. Example 1: This is what happens when sulfuric acid, like car battery acid, is heated to the boiling point and dropped on nylon webbing. The charring on the surface fibers deteriorates the sling and will continue to get worse, severely affecting the webbing strength. 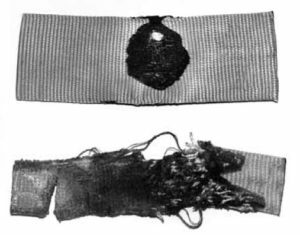 Example 2: This is what happens when nylon webbing is immersed in sulfuric acid at room temperature for three weeks, resulting in major damage. Note the fibers are softened and swollen, and the entire fabric is grossly distorted, virtually destroying the webbing. You can help prevent this damage by never storing slings in areas where they may be exposed to acid or acid fumes, which are as destructive as liquid.